Cimmeria is a safe world, protected from the Goa'uld by Thor's Hammer, a device at the end of a long underground labyrinth which kills any Goa'uld, leaving only the host alive. When SG-1 arrives, a mysterious device detects the Goa'uld within Teal'c, and sends both Teal'c and O'Neill to the underground maze. There they must fight for survival against Unas, a vicious creature who was the first Goa'uld host. Meanwhile, Kendra, a former Goa'uld host who survived her own journey through the Hammer, aids Daniel and Carter in finding a way to rescue O'Neill and Teal'c, and destroy the Hammer. The stargate system may have been built by an ancient race other than the Goa'uld. In Norse mythology, Thor was a friend to humans and protected them from the Etins, powerful enemies of mankind (Goa'ulds). All Jaffa know the coordinates for Cimmeria to ensure no Goa'uld goes there. The Sagan Box, or "GFT" item, uses Sagan Institute drawings to represent Earth. The scanning beam from the monolith detects Goa'ulds and sends them to the Labyrinth and Thor's Hammer to be removed from the hosts. Thrudvang is Thor's home in the stars. Midgard is the ancient home planet (Earth) from which Thor first brought the Cimmerians. The hologram of Thor identified himself as "Supreme Commander of the Asgard Fleet". The High Council of the Asgard designated Cimmeria a safe world for developing sentient species by unanimous decree, era 40.73.29. Hall of Mjollnir is the location of Thor's Hammer in the underground Labyrinth from which only the host can leave alive. Kendra consults with the Valkyrie who speak through the thunder. 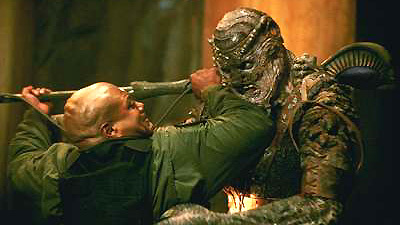 Once a Jaffa carries a Goa'uld larva, it acts as his immune system. Kendra is from Jebanna where she was captured when Marduk raided the temple where she was raised, and was taken by the Goa'uld. She came to Cimmeria and was freed by the hammer 10 years ago, proving that something of the host survives. Unas was the first Goa'uld host, born of the same primordial waters as the Goa'uld, but became a myth. He has great regenerative powers, can use long periods of sleep to survive, and may have been in the Labyrinth for 1000 years. Other, older species have been used as Goa'uld hosts before humans. When Thor's Hammer was destroyed, the cave will be sealed as protection from the Goa'uld. You're a little short for gods.